In February of this year, Oklahoma City police officer Chad Peery was off duty having dinner with his father, when three men in the back of the establishment began causing a commotion. The owner requested help getting the three men to leave the building. Peery was off-duty, but as an officer made it his responsibility to help. Tragically, as Chad escorted the men to the door, they turned on him. He was badly beaten and left paralyzed by the incident. Peery has been in rehabilitation and has been making a remarkable recovery. He believes he will walk again and has always kept a positive attitude and a smile on his face. 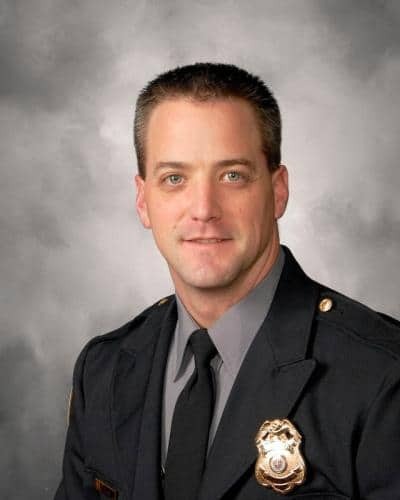 Peery recently received a standing ovation when being honored at a local baseball stadium, where he loved to work security as an off-duty police officer. Chad Peery has proven to be a true hometown hero and the city of Oklahoma City has been there with overwhelming support for both him and his family. Peery has four children age 9, 7, 6, and 3. Below is a video about Peery from his rehabilitation center where he received the 2011 Jim Thorpe Courage Award. Jen Goodwin’s life changed in the blink of an eye when she sustained a serious spinal cord injury on a neighbor’s boat. Learn about her path to recovery and her determined spirit in Part One of a two-part series of blog posts. Jen Goodwin’s life was forever altered by a boating accident that left her quadriplegic, but she was determined not to let her spinal cord injury be an obstacle to her life goals. Find out more about her life since rehabilitation therapy and the goals she has achieved in Part Two of our two-part blog series.